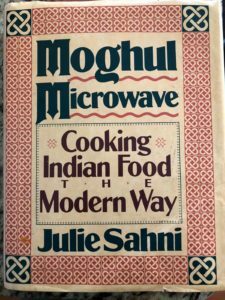 In the 1930s and ’40s, when Mary Frances began her concurrent explorations of cooking and writing, most writers did not cook, probably because these writers were primarily men. 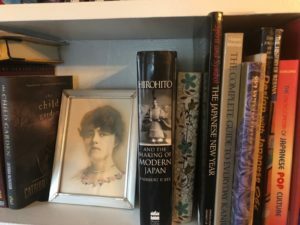 And the earliest published women writers who were lucky enough to have the space and time to do this work—Edith Wharton, Virginia Woolf and the like—were typically upper class and had household staff to feed them. I love to write, and my escape from the stress of writing is cooking. 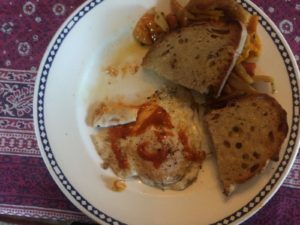 if you follow my blogposts, you’ve seen me wax rhapsodic about mushrooms, about Parsi eggs dishes, and all kinds of food. 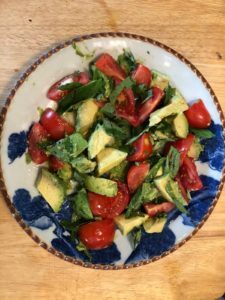 In my quest to spend more time on writing, I am striving to be more balanced in the kitchen—and to also explore whether certain food powers my brain to focus better. I’ve read several cookbooks with recipes promising better neurological health, but my goal is not to work with cookbooks as often as I’ve been doing. 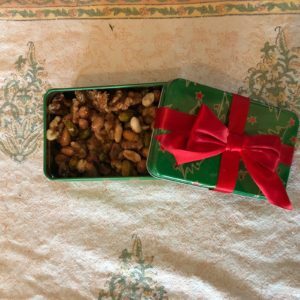 This year I asked myself: what is the healthiest way to fill both the stomach and the imagination? How can a person too easily diverted by cooking avoid such temptation when she’s alone at home? Plenty of writers have decided it makes sense to write outside of the house—and to eat there as well. In this era, they are mostly at Starbucks. I prefer to think of Dorothy Parker striding into the restaurant inside the Algonquin Hotel for breakfast and lunch with her friends. Not that she used a pen at the table! It was all about joking, drinking, and probably not getting much done in the afternoon. Okay, let’s return to the present. Have you ever tried going to a real restaurant with your laptop? While it’s nice to have eggs and toast brought to me at the table, once I’m finished with my plate and continue to write, I feel like a barnacle on the side of the establishment. And how does the writer handle bathroom breaks in the restaurant? Do I leave the laptop containing my big project on the table, or carry it to the potty the way I’d bring my purse? There’s nothing wrong with dining at home on food prepared elsewhere. However, to undertake this needs a good deal of planning, and the food choices that look the most beautiful are often destructive. A sugar-dusted doughnut is tempting with morning coffee, but it will make me shaky and unable to concentrate within a few hours. Gourmet sandwiches from stores often stand six inches high and are made from such thick bread that they also put my insulin into overdrive. And don’t get me started on full-sized entrees from proper restaurants. If you’d like to see me snoring through the afternoon, just serve me a delicious, heavy lunch. This year, I am streamlining my dining at home. My goal is not to spend longer than 30 minutes cooking anything during my workday. Here’s the M.O. 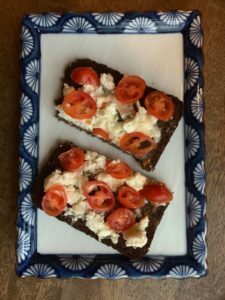 For breakfast I toast good brown bread from a local bakery, and I top it with a quality cheese or jam, and several times a week the toast topping is an egg scrambled with vegetables. I take vitamins and calcium on the side, and I try to drink a couple of glasses of water. I am seriously dehydrated, all the time. 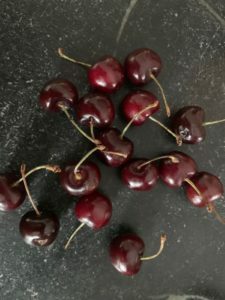 Ahh, the antioxidants in cherries! After that, I try to write at least two hours. Fresh or cooked fruit is the second energy shot that I take around 10 in the morning. After that, I break for some activity at the gym. Lunch is always eagerly anticipated. Like breakfast, I eat it by myself, so I don’t have to worry if anyone else likes what’s going on the plate. A fridge full of leftovers means various cups of soup, beans, small cooked vegetables, kimchee, and rice. Sometimes there’s even a half-serving of chicken or fish or a couple of meatballs. So, how is my meal different from tapas? I can imagine Dorothy Parker poking fun at my lunches, especially since they are washed down with a glass of water and a couple of Vitamin D gummy raspberry chews for dessert. I work again. Around 4 p.m. I’m often craving salt. 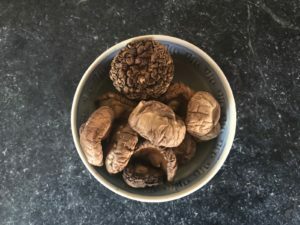 The standard snack to fill the void used to be crackers and cheese, but now that I am trying to reduce dairy, I dip raw vegetables or plantain chips in hummus or munch some almonds or cashews. 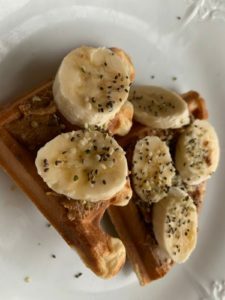 If I have a sweet craving, I might slather peanut butter on a toasted waffle (I keep a few homemade ones in the freezer) or Nutella on a digestive biscuit. The writing day is done by five and cooking is once again allowed! I I relish the chance to sway between the fridge and stove and bend to lift up pots and pans. I usually cook meat or fish with vegetables and some form of rice. Usually it’s Asian or Mediterranean food—easy dishes flavored with spices and herbs—true friends with benefits. 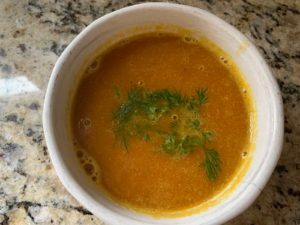 I often use the InstantPot to pressure cook dried beans or to concoct a dal that can be eaten at a few different meals during the week. My husband likes this kind of food. My children do not. You might have noticed something missing in my diet. It is coffee, the infamous element in a lot of writers’ rituals. I drink about one and a half-cups of locally roasted coffee made in a French press at breakfast. I might have another cup in the mid-afternoon if I’m dead-tired and have to go out and drive the carpool or drive to a faraway book signing. But chain-drinking coffee does not make me feel grounded and focused on work—it gives me the jitters. Some therapeutic drinks that work for me throughout the day are water, black tea, green tea, mint tea, and before bed, the venerable chamomile. Writing a book is slow work, and in my experience, it can be detrimental to the body. There have been years when I would sneak downstairs from my study to snack as a way to escape the half-written page. I’m no saint—if I know there’s chocolate in the cupboard, I may have an afternoon binge. But overall, I take a great deal of pleasure in eating this way. Am I feeding my mind? I don’t know about that—but I do feel sated. A doctor once reassured that it’s normal for a writer to be disorganized. Clutter goes hand in hand with creativity. That my excuse for my lifelong for tendency to fall victim to clutter. But looking at it doesn’t make me feel calm. Because of my issues, I find it escapist entertainment to read books and watch TV programs about cleaning and organizing. I recently binge-watched a great program on Netflix, “Tidying Up With Marie Kondo.” I’d already read her two books, The Life Changing Magic of Tidying Up and Spark Joy, although I’ve followed of her teachings so far is to declutter about thirty percent of my clothes. I’m charmed by Marie’s warmth and playful excitement when it comes to transforming chaos into serenity. Yet critics are attacking her for her ideas about book tidying. 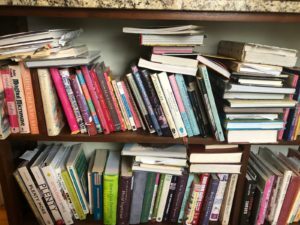 In truth, she does not advise a certain number of books for anyone, just as she won’t guide people on which items to discard from their drawers. 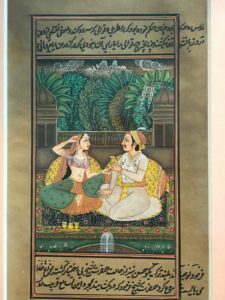 But she does suggest paring down in a few different ways in order to make sure what we have are books that are used or that are physical embodiments of comfort and happiness. I decided to see if Marie’s approach could help me with my book problem. I typically donate dozens or up to a hundred books every few years. Such book purges are often inspired by moving house. I only throw away a book if it’s damaged. When every town had several used bookstores, I’d find buyers for some of the haul. Used bookstores are so few and far between these days, so it’s easier to donate. When I lived in Minnesota, I could drop off used books in good shape to be shipped to readers in Africa, part of a humanitarian effort our own Michael Stanley championed. In Maryland, the best option is to carry cartons of books to The Book Thing, a nonprofit located in an old industrial building a couple of miles away from my home. Every Saturday, The Book Thing attracts browsers who pick up whatever they’re drawn to. It’s got the same vibe as used bookstores I remember from the old days, only instead of the books costing $1 to $10, they are completely free. As I think about this, I visualize people discovering my books, hopefully feeling like they got a steal on an immaculate coffee table cookbook or autographed mystery. The trouble is I have to get the books off my shelves first, and decide who gets to stay in the nest and who will be sent out to fly. Marie advises gathering all the books into one place and then start sorting. But when we are talking about a couple thousand books on three floors, that sounds like hard physical labor. 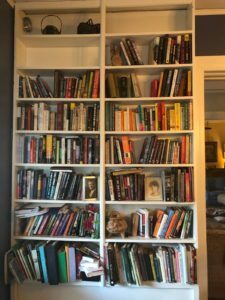 I like the expression “to pick low hanging fruit.” So I began with the long, built-in bookcase my husband built for our cookbooks in the butler’s pantry. 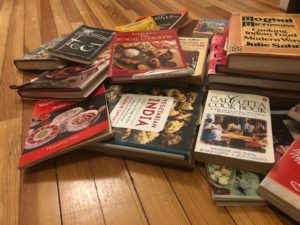 Cookbooks are unemotional handbooks not literary keepsakes—and we have more than three hundred. Yes, three hundred cookbooks owned by a couple who probably cook dinner four times a week! Tony and I began buying cookbooks when we married in our twenties and were dreaming of a domestic future. If we tried to cook every recipe in this collection once, I am certain that we would die before we were done opening cookbooks. Morbid thoughts aside, I addressed the bookcase. Most of my cookbooks feature cuisines of different countries. I’ve always rationalized storing them as authoritative resources I may turn to in the future, when I am cooking as often as Nigella Lawson (ha ha). Tony has his own favorite cooking tomes from his hometown of New Orleans, as well as Julia Child classics that I am keeping without question to preserve marital harmony. There are also a few easy cookbooks I received when I was a little girl that must be saved for future grandchildren. Jammed in between the books we often use are slick, trend-driven cookbooks that publicists sent to the Baltimore Evening Sun when I used to write their cookbook reviews, and dozens of cookbooks collected when I was in Japan and India that are part and parcel of the novels that I write. 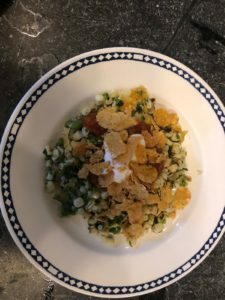 When I describe a Japanese rice gruel that is spoon-fed to the ill, or a caramelized onion dal served at a palace, the origins of these dishes are in my cookbooks. I hardly ever cook Japanese food anymore, so I’m only saving two of those books. 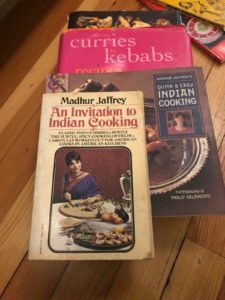 However, I continue to cook Indian food regularly, so most of these cookbooks, large and small, weathered this purge. But I thanked about twelve of them for their service and hope they find homes with Indian food lovers who shop at The Book Thing. They will be part of the donation of about one hundred cookbooks. I can’t boast that my shelves look splendidly organized, but at least everything’s in the right section. I know to locate any Italian cookbooks on the far-right bottom shelf, the vegetarian cookbooks in the case’s top shelf, and all fifteen Louisiana cookbooks stacked in a column running down the center. It took two to three hours to go through this book case, which is not an inconsequential amount of time. Yet the hours spent sorting turned out to be a sentimental return to past journeys and meals. I came away feeling certain that that books are food … and food is better when shared. After we had a dead elm tree cut down last year, little white mushrooms sprang up on the wood-flecked ground. I was nervous because we had just taken in a Yorkshire Terrier puppy with an appreciation for organic material. Daisy snuffles up berries, pods, pinecones and black walnuts faster than I can stop her. But for some reason, she stayed away from the tiny white mushrooms, which I think might be Chlorophyllium Molybdites, the Green Spored Parasol, a poisonous mushroom that looks like a white button mushroom. But Daisy ignored the mushrooms, just as I don’t see rabbits, birds and squirrels eating them. Somehow they must have a genetic aversion. It isn’t that way for people. My eyes tell me that the mushrooms in my garden are beautiful as the ones at a high end grocery. I look at such mushrooms and imagine them sautéed in butter. Mushrooms have power: both for the bad and the good. Over the winter, I did some reading and learned that the oyster, enoki, maitake and shiitake mushrooms are taken by patients to fight tumors. And there’s one very powerful Chinese mushroom, the Red Reishi, that has been used to treat many diseases, including cancer. What about the small wrinkled cone-headed mushrooms that grow wild in the United States called the morel? I adore the morels that grow plentifully in the upper Midwest and are hand-collected in the wild and sold in co-ops. However, I’ve learned there’s a “false morel” that looks just like it that’s poisonous. Umm…. And let’s be realistic. Morels are too pricy to be eaten more than a few times a year. 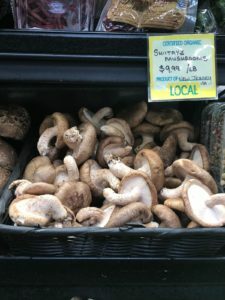 However, an 8-ounce container of local oyster, and white beech and brown beech mushrooms (also known as bunapi and bunashimeji) is about $5.99 at the local organic grocery in my neighborhood. 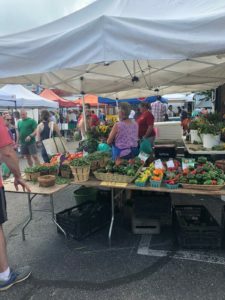 If I get up early enough on the weekend, I can buy a similar portion of fresh maitake, fan mushrooms, chantarelles and shiitakes for $5 at the farmer’s market. I cradle all these unwashed mushrooms in a cotton bag that stays in the refrigerator. They stay happy and resist turning slimy for up to two weeks—though I’ve usually finished them well before that time. 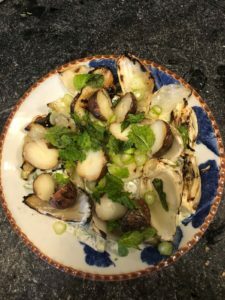 As spring arrives, I realized that mushrooms have nudged themselves into becoming 2018’s food of choice. I’ve cooked a lot of them, and I’ve savored truffles twice—both in a truffle mayonnaise on chips at Charleston Restaurant in Baltimore, and in the truffle-stuffed ravioli at the Fearrington Village Inn in North Carolina. These are the splurgiest, most umami-laden mushrooms around, reputedly costing $2800-3200 a pound, if you get the white ones. But a little goes a long way, because the flavor is so tremendous. 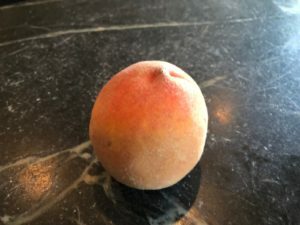 Making a deep dive into a “food of the year” has become a habit for me. When I was researching India’s Parsi community in 2016, I found myself cooking more eggs in Parsi manner, often poached atop vegetables. 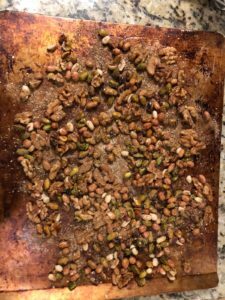 This was a fantastic and easy food to focus on. 2017’s food of the year was quinoa, because I finally learned to make it taste good, and it went into soups, salads, and as a rice substitute. In 2009 it was homemade bread (I gave up that practice, never quite mastering it, and knowing that I didn’t want to eat bread twice daily to use it up). I have a head start on the mushroom game because I’ve been cooking mushrooms for years. Three out of four members of our family like them (not a bad ratio considering they are “fungi”). One of our favorite family dishes for many years was the mushroom stroganoff from Deborah Madison’s Vegetarian Cooking for Everyone, but that calls for ordinary large white mushrooms. We were happy in the past, but I think cut-up oyster mushrooms are going to vault the dish to the stratosphere. The mushroom risotto recipe I like comes from The New Vegetarian Epicure, and its author, Anna Thomas, isn’t playing. She calls for a mix of morels, porcini and shiitake, as well as dried porcini as a flavor builder. You don’t need a cookbook to make a fantastic mushroom dish. Sauté them with onion and add lightly beaten eggs for an incomparable scramble. Garam masala or curry powder is the final touch. For lunch, I love to make a quick Asian noodle soup, starting with sautéed onion, ginger and enoki mushrooms, and throwing in either vegetable, chicken, or beef stock. A spoonful of white miso goes in along with a little chopped raw spinach or bok choy. 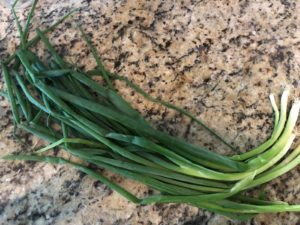 That last bit cooks two minutes and then I ladle in a bowl with scallions on top. Or how about a mushroom gnocchi bowl for supper that’s ready in less than thirty minutes? 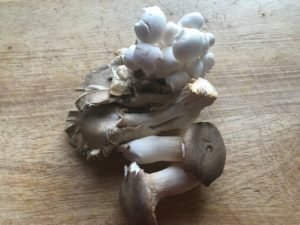 Start with a cup of mixed specialty mushrooms such as shimeji and maitake, all broken apart into medium sized pieces; a quarter cup of chopped onion; two minced garlic cloves. Sauté in butter and olive oil until lightly brown and then pour in 4 cups of any vegetable stock. Simmer ten minutes and then throw in potato gnocchi from the store and 1/3 cup of frozen green peas. The gnocchi will be tender in about 3 minutes; you’ll know when they rise to the top. 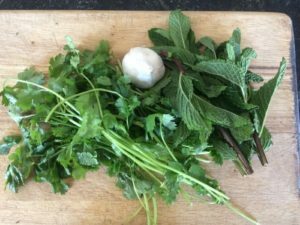 Toss minced parsley on top, if you are fancy, and ladle it into bowls. I don’t know that eating small mushrooms with a grand reputation will save me from disease. But I eat them several times a week now. I might even try growing them. 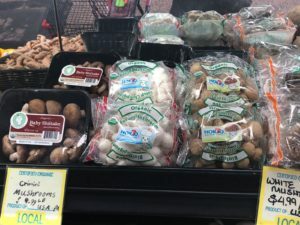 I’m eyeing an “organic mushroom farm” I saw at Mom’s Market. The final frontier would be taking a mushroom walk with a forager, but after what I’ve read about evil lookalikes springing up next to morels and chanterelles, I’m not sure it’s worth the risk. In the height of summer, a heap of imperfectly gorgeous tomatoes rest on my kitchen island. They beseech me to touch them and make something great. The obvious thing would be to make a lush sauce—but it’s 90 degrees outside, and I’m not in the mood for cozy Italian pasta. No. These tomatoes are calling out their wish to become a chutney. “Chatni” is a classic accompaniment to a South Asian meal containing rice, meat and vegetable dishes, and breads. In a typical chatni, fruits and vegetables such as tomato or mango are slow-cooked with spices and ginger, various forms of chilies and the solid brown sugar called jaggery. Jaggery comes from palm sap or sugar cane and is sold in Asian grocery stores. Sometimes garlic and onion are part of the mix. Before the British, mustard and other oils were used to help keep the chutneys from spoiling. The ingredient of vinegar in chutneys comes from Britain, but is now part of some Indian chutney recipes. Yogurt-based sauces also are known as chutneys; most famously the coriander-mint chutney served at almost every Indian restaurant, and the creamy, sweet and spicy coconut chutney essential to South Indian dosa. When the British tasted chatni, they loved it. They anglicized the spelling to “chutney” and found ways, after they went back to Britain, to make new chutneys with fruits like apples, plums and rhubarb and the preservative vinegar. 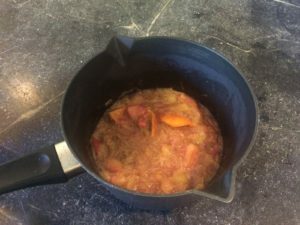 A few months ago, I had a great experience making rhubarb chutney. 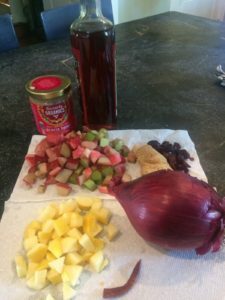 They also created “Major Grey’s Mango Chutney,” a style of sweet and sticky chutney containing raisins, vinegar and a bit of tamarind that is an ingredient in many an American chicken salad. In my family, it is the standard slather over a cheddar cheese sandwich—or grilled cheese. Sweet mango chutney is the starter chutney for children who are cautious about foreign tastes. Growing up, I had a big spoonful of sweet mango chutney with almost every home cooked Indian meal. I can’t imagine eating biryani without some mango chutney mixed in. 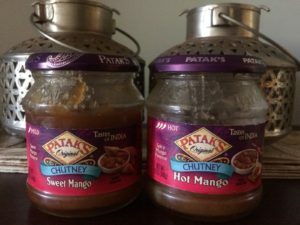 These days, Indian food companies such as Patak’s make these Anglo-style mango chutneys with chilies included, if you like. 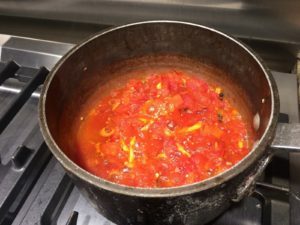 Back to the homemade tomato chutney. 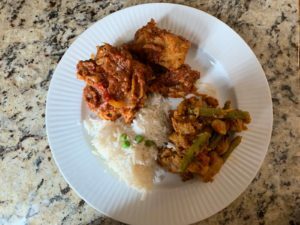 My recipe is inspired by a traditional one found in The Calcutta-Cookbook, A Treasury of Recipes from Pavement to Palace by Minakshie “Kewpie” Das Gupta, Bunny Gupta and Jaya Chaliha. 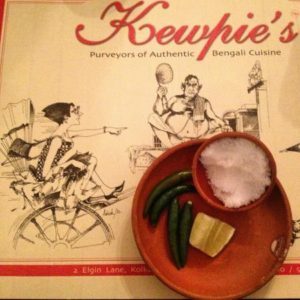 Kewpie was a legendary Bengali home cook and cookbook writer. After Kewpie’s passing, her family opened a jewelbox of a café in her honor within their historic home at 2 Elgin Road. Kewpie’s is a must for lunch, if you are visiting South Kolkata. And the cookbook details how to make “Colonel’s Sweet and Hot Mango Chutney,” which is surely more delicious than the commercial version. During my frequent lunches at Kewpie’s in the late 1990s, I enjoyed food served on banana leaves and old-fashioned terra cotta plates. There would always be several extraordinary fresh chutneys served. Not to mention spicy pickles—but vegetable pickle is a story for another column! 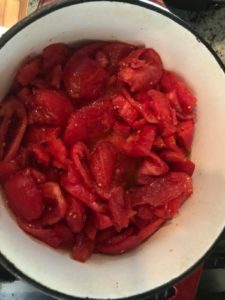 My tomato chutney, which does not include raisins or too much chili firepower, is great on sandwiches, burgers, alongside grilled meat and fish. 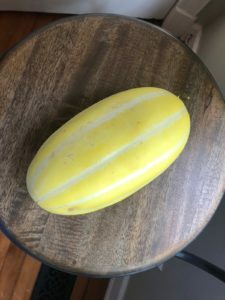 You can mix in 1/3 cup of it with eggplant that’s been roasted and mashed. You wind up with something very much like the famous dish Baigan Bharta, but with 75% less work. The farmer’s market sells larger bunches of herbs than can be eaten in a week—so again, the answer is chutney. I make my cilantro-mint chutney with Greek yogurt for extra protein. It’s a natural with crispy treats like samosas, pakoras or with grilled fish. This green chutney is a great marinade for chicken pieces to be baked or grilled. 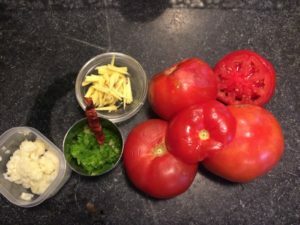 Here are my tomato, cilantro-mint and rhubarb chutney recipes. Please note that these chutneys are designed to be refrigerated in glass jars or bowls with lids. They are not shelf-stable. I’m winding up my culinary adventures to return to my real work: writing a novel. It strikes me, though, that concocting a chutney is a bit like writing a mystery. There are so many interchangeable small parts: fruits and vegetables, spices, and preserving vinegars or oils. When I write, I pull together many pieces: characters, plots and sub-plots, settings, conflicts, motivations. I contemplate when I’ve got too much of one thing or am missing an important element. My book’s components are adjusted as it grows toward a finished state. But while it takes a year for me to write a book, a chutney rarely simmers more than thirty minutes. This makes it a small but gratifying accomplishment. Pink rhubarb stalks fill the tables at farmers’ markets in early spring. With the stiff body shape of celery and the tender texture of a fruit, rhubarb is the barb of jokes—a misunderstood and under-appreciated bit of produce. I speak as a rhubarb convert. The first time I saw the ragged green plant growing near the garages of my first two houses in two different states, I thought it was an inconvenient weed that needed to be dug out. Someone explained it was rhubarb, but I still wasn’t drawn to trying it. For starters, the rhubarb was on a dog-walking route. I’d seen canines appreciating it. I also recalled stories about part of the rhubarb plant being poisonous. But the shunned rhubarb gnawed at me. Cafes and gourmet friends offered me delicious desserts where rhubarb was an ingredient, sometimes mixed in with strawberries or other sweet fruit. I developed respect for the soft, tangy substance that was proving itself a valuable team player. I felt better knowing just the big green leaves of the plant are full of oxalic acid—the infamous poison. 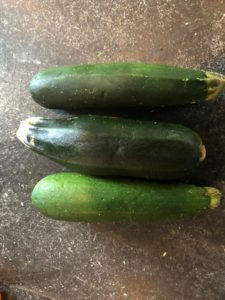 The stems are edible raw or cooked. 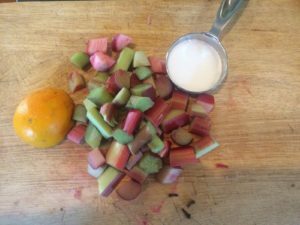 I bought my first bunch of rhubarb from the Wedge, a Minneapolis co-op grocery. Since rhubarb does very well in places with cold, wet winters, Minnesota turned out to be a prime spot to buy rhubarb. I made a cobbler that I thought was tasty, although nobody in the family clamored for it. Too sour, they said. In my mind, rhubarb’s tang is similar to that of lemon curd—but ever so much more succulent. 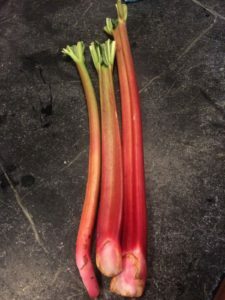 And rhubarb’s got more going on that the average fruit or vegetable. Both Chinese and Europeans discovered the stems aid with digestion, so it was used as culinary medicine. Rhubarb is rich in calcium, and Vitamins C and A; however, its superstar ingredient is Vitamin K, which fosters brain health. A single serving of rhubarb provides 45% of suggested daily Vitamin K.
Rhubarb enthusiasts have their own heaven on earth. The Rhubarb Triangle is a nine-square mile area between three villages in West Yorkshire. 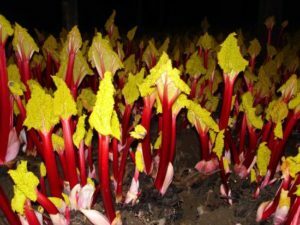 For generations, Yorkshire farmers have treated rhubarb like royalty, raising it in barns lit by candles in order to avoid sunlight’s photosynthesis, that would color the leaves and stripe the stems green. This results in a deep red color of the stems, and supposedly sweeter flavor. Rhubarb Triangle-grown rhubarb plants have leaves that are chartreuse! The thing about garden-variety rhubarb is one only has to add sugar to make it what you want. Apparently rural children sometimes eat raw rhubarb canes are dipped in sugar and eaten. I tried this, but it was too hard and sour for my taste. It brought me back to thinking about poison. The mystery writer began pondering exactly how rhubarb could wreak havoc. 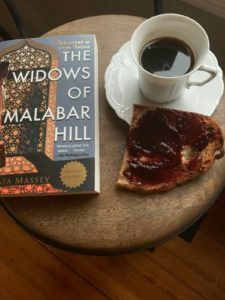 She imagined an impatient woman in her fifties serving lunch to her eighty-year-old aunt, a wealthy woman who’s a health fanatic and has been living too long for everyone’s taste. 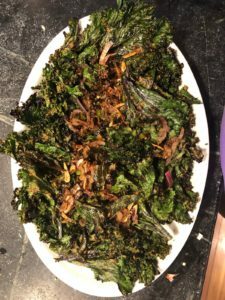 The oxalic acid leaves were shredded and went into a salad with a sweet dressing. The evil lady’s idea was that the bitter taste would be misidentified as escarole or another bitter lettuce—greens that the elderly aunt approves of. However, you’d have to eat a LOT of rhubarb leaves to die, rather be sickened. My guess is the old lady would recover and write her niece out of the will. One farmer’s market bundle of rhubarb can be transformed into one very sweet cobbler or pie. But you can find those recipes everywhere! I took that bundle and divided it to create two non-dessert rhubarb recipes. They’re so easy you can cook them at the same time and have a rhubarb compote with yogurt for breakfast, a cheese-and-rhubarb-apple chutney sandwich for lunch, and a scoop of that chutney with an Indian or Western dinner. If you really wanted to push it, you could put warm compote with ice cream or on cake for dessert. 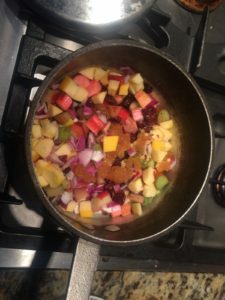 In a small non-reactive saucepan, add rhubarb, apple, cranberries (or cherries), onion, water, honey, ginger, vinegar and crushed red pepper. Bring to a boil, stirring occasionally. Reduce heat to medium-low, cover and simmer until rhubarb is tender, about 10 minutes. Uncover and simmer about 5 more minutes, until it becomes a thick sauce. Pour into a glass container with lid and refrigerate. Rhubarb-Apple Chutney is good with rice and other elements of an Indian meal, or on the side with grilled or roasted meats. It’s also nice on a sharp cheddar cheese sandwich. The chutney will keep in the refrigerator for about a week. Combine all ingredients in a small non-reactive saucepan. 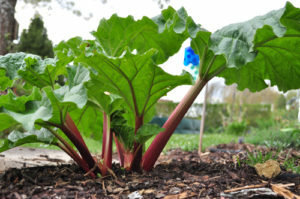 Cover, bring to a rapid boil and cook over low heat for 15 minutes, until the rhubarb is tender, stirring occasionally. After the compote has cooled, taste it for sweetness and add extra sugar if you like. Remove the orange peel. Pour into a glass container with a lid and refrigerate. Rhubarb compote stays fresh keeps in the fridge for one week. 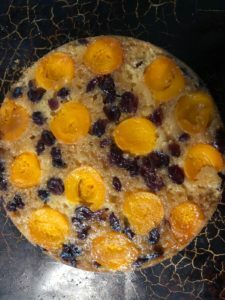 It’s good with Greek yogurt or whipped cream; mixed into porridge; or spooned over pancakes or sponge cake. One word to the wise is the two recipes look almost identical, once cooked. So label them—unless you like the taste of red onions mixed with ice cream. I’ve had a little too much Thai, Indian and Vietnamese restaurant food lately. Even good food can become boring. Looking for another Asian taste, I decided to go after the obvious: Korean food. Fortunately, there are a lot of Korean immigrants around Baltimore. 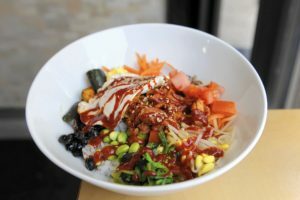 I’ve dined at places ranging from multi-starred restaurants in the suburbs to the casual Korean take-out counter at R House, the great new food hall in Baltimore’s Remington neighborhood. This has been a fun project. I’ve noticed that in almost every dish, a special flavor tickled my tastebuds. That is the taste of gochujang. I first tasted gochujang in the delicious marinated grilled meat dish called bulgogi. 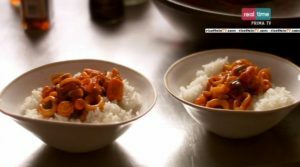 It gives the robust red color and flavor to Korean stew dishes known as jigae and is also stirred up and served as a condiment. 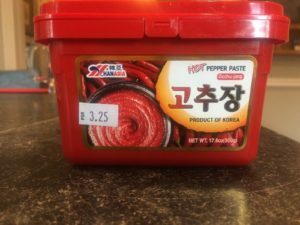 The elevator pitch for gochujang is “a cross between miso paste and Asian chili sauce.” But this paste is not nosebud-clearing spiky-hot like Sriracha sauce, another favorite condiment of mine. Gochujang has a good, deep kind of hot and a complex, almost-meaty dimension foodies call umami. Gochujang has become buzzy in the West for the last five years, although it dates back to at least the sixteenth century in Korea. Someone clever took the mellow Korean chili known as gochu, dried it, and crushed it. This was mixed with powdered rice, powdered fermented dried soybeans, sprouted barley and salt. 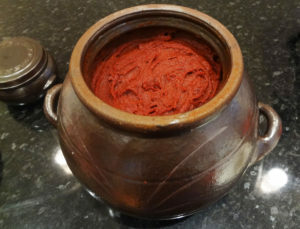 Fresh gochujang paste is stored in a ceramic crock outdoors for six months before eating. The fermentation creates the healthy lactobacillus to support healthy digestion; and the chili element within the food inhibits spoilage. Chilies contain capsicum, which some say helps fight obesity. In any case, gochujang has some other great nutrients: Vitamin B2, Vitamin C, protein and carotene. It tastes like heaven, but it isn’t junk food. Korean purists still make gochujang by hand, just as people in Japan still make tofu and miso. Fortunately, there are a few potters interested in making the proper jars, which must be screened at the top to allow ventilation. It’s almost like the composting I’m trying to do in an old trashcan in my yard. I wanted to get a gochujang fix the easy way. That meant shopping. I found many tubs of it on the shelf of the Asian supermarket a few miles from my house. After the gochujang tub opened, it needs to go into the refrigerator. I put it there while I pondered what to do next. There were many choices. I can’t count the ways I’ve seen gochujang as an ingredient in non-Korean recipes, particularly as a drizzling sauce or mixed in with mayonnaise. 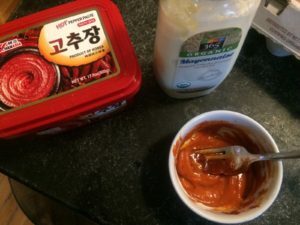 One of the first things I did was make gochujang mayonnaise that was used for many purposes. I also decided to put a spoonful of gochujang in the soy-stock mixture I use for vegetable stir-fry. A dish with Chinese origins was changed—and not for the worse! While I was taking baby spoonfuls out of my pepper paste tub, the food people have crafted grand new recipes. British cooking author and TV host Nigella Lawson blended Italy and Korea in her original recipe for Korean Calamari and then she blended India and Korea in Korean Keema. Turkey and gochujang are a popular combination. I like the ingredients in Blogger Lemon Lime Lisa’s gochujang turkey meatballs which would be a great party hors d’oeuvre. Here’s a great slideshow roundup of gochujang-flavored dishes from Bon Appetit. Without realizing it, I used up my whole gochujang tub on silly little ideas. I wanted to do something big. One Saturday, I went shopping for a new container of gochujang and decided to lavish it on a small pork loin. First, I browned the 3-lb. hunk of pork in a little oil. Then I added in 1/3 cup gochujang paste, 1/8 cup soy sauce, 1/8 cup of honey and ½ cup of chicken stock. I let the loin braise in the spicy potion for 8 hours, until cooked through and very soft. I took out the loin to rest and boiled down the remaining red-brown cooking liquid to make a velvety brown sauce. Okay, I apologize for the lack of photograph; when the pork was ready, I had no impulse control. The pork loin was a bit too much for just my husband and me to eat. 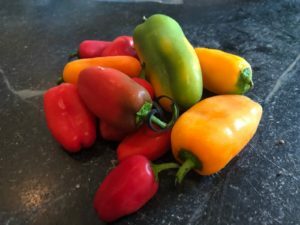 Still, it was excellent, from the first night, when it was presented like a roast with polenta on the side; to the next day’s lunch, when it went inside a tortilla wrap along with lettuce and radishes; to the grand finale two days later, soft tacos with fresh chopped vegetables. By the end of my gochujang experiment, I wasn’t bored. I was filled by another of capsicum’s supposed benefits: euphoria.